Jason Heyward was a key part of the Cardinals' 100-win 2015. Will he stay? Heading into the offseason, retaining free agent Jason Heyward is the most important thing on the St. Louis Cardinals’ to-do list. After a season that saw several key players spend time on the disabled list, Heyward the model of consistency. 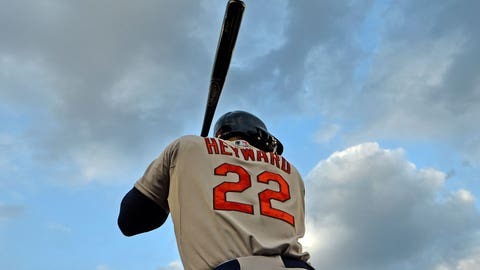 In his ‘contract year’ after coming over from the Atlanta Braves, Heyward hit .293/.359/.439 with 13 home runs, 60 RBI and an outstanding 6.5 WAR in 154 games. As MLB.com’s Jennifer Langosch pointed out, Heyward picked up 10 outfield assists and led the Cards in hits (160) and stolen bases (23). Langosch added that when the Cards made the trade, they sent 10 years’ worth of young, low-cost pitching to Atlanta determined to make sure Heyward stuck around past just the 2015 season. So will it happen? Will St. Louis be able to entice Heyward to stay in town with a lucrative contract offer? That remains to be seen, though Heyward told Langosch he enjoyed this season in STL: "I did a lot of growing this year, as a player and as an individual. I had a lot of fun playing with this group of guys and this coaching staff and the fan base. Job well done on our part, but this wasn’t the last step we wanted this year." In fact, he called himself ‘fortunate’ to have had the chance to be a Cardinal for at least the 2015 season: "This is definitely an ideal situation. I can’t tell you what’s going to happen. I wouldn’t have been able to tell you a year ago I would be in this spot right now. But I’m very fortunate to have had the opportunity this year to play with these guys. We’ll see what happens." Given how much they gave up to obtain his services, it seems like it would be a surprise to see the Cardinals not find a way to retain Heyward. While they do have a variety of outfield options ready for full-time duty, including Tommy Pham, Randal Grichuk and Stephen Piscotty, there’s simply no denying the value Heyward brought to the club this past season.